One of the benefits of being recently returned to Copenhagen is a wealth of generous brunch, lunch and dinner invitations from friends whom we haven’t seen for a few years. This would be a treat in any part of the world and with any people we consider friends, but it’s a particular pleasure here in Denmark, where the Danes bring their classic sense of design, style and quality to the art of entertaining at home. In a little over two months, we’ve been the fortunate guests of numerous friends, and each one has presented an experience that would seamlessly fit into a Kinfolk Magazine spread or a Scandinavian-themed Pinterest board. Amazingly, however, our friends here in Copenhagen seem to pull these lingering meals together with a kind of effortless grace, making it look completely natural and never showing any signs of being flustered or overwrought. Our hosts lay incredible spreads out upon perfectly styled tables, smiling and politely declining offers of help that, in truth, don’t really seem necessary when everything is running so smoothly. In case you are thinking that this is only a show put on for the infrequent guest, I can vouch for the fact that it is something far more deeply rooted in the Scandinavian style of entertaining. Of course, we have experienced gracious hospitality when we’ve planned visits with friends a week or two in advance. But we have had similar experiences with our very close friends, as well, who have suggested a get-together with virtually no advance notice. Once, our friends invited us to come by after church, where they somehow pulled a delicious meal together out of thin air, complete with freshly made Swedish semla buns. Another time, some dear friends suggested we swing by in the evening to play board games for a few hours. We arrived to find candles lit and two platters full of gorgeous smørrebrød, or open face sandwiches, ready and waiting for us. This was hospitality-on-demand, with very little lead time or planning. Copenhagen is home to some amazing restaurants — in fact, one of them was ranked the world’s best restaurant for four of the last five years! 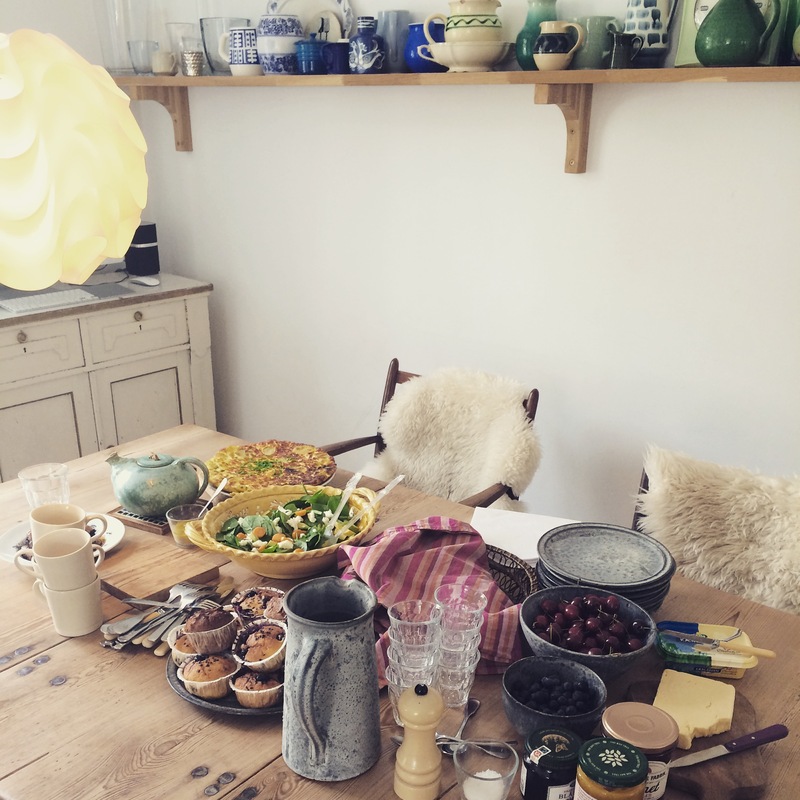 But I can honestly say that even the simplest meals at home with Danes tend to be a lovely, gracious affair. This is one of many areas where the Danes excel and where I strive (probably in vain) to emulate them. I’m working to crack the code for Scandinavian entertaining, so I’ll be sure to share any secrets I uncover! Note: The beautiful table above was actually laid by a British friend who kindly hosted us for Sunday lunch, but I think her many years living in Copenhagen have given her entertaining a distinctly Scandinavian flair. We did, however, love the English sausages and aged cheddar, which you wouldn’t normally find on a Danish table! 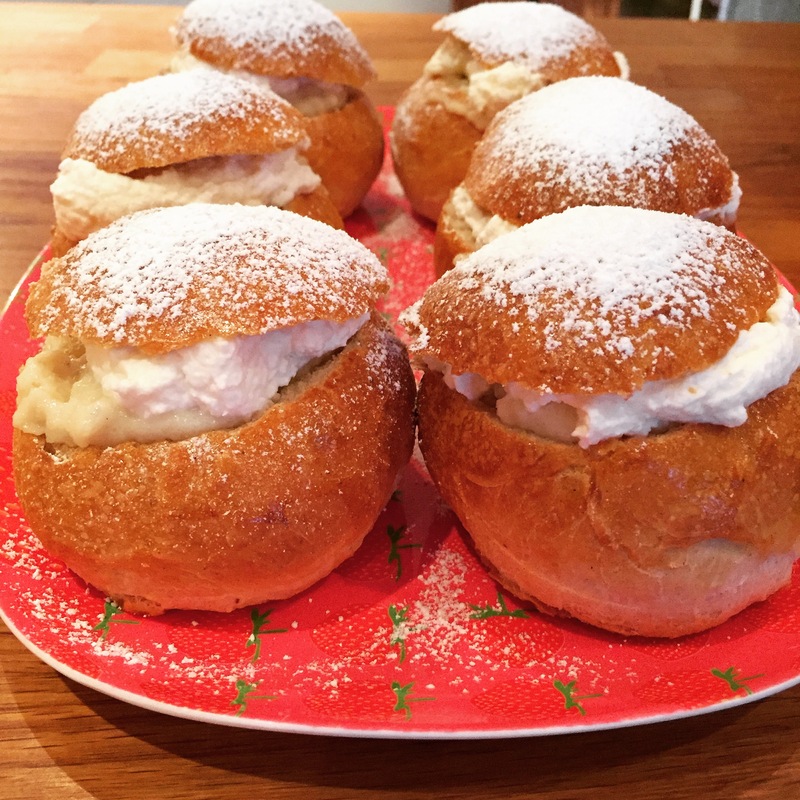 Below are the mouthwatering semla (a Swedish sweet roll) that our friends whipped up one afternoon. yum…i need to come back STAT.